According to the Social Media and Online PR Report 2010 by Econsultancy and Bigmouthmedia, 95% of surveyed companies (mainly in the UK) have been involved in social media. But only 18% say they are heavily involved. 40% have experimented with social media but not done much. 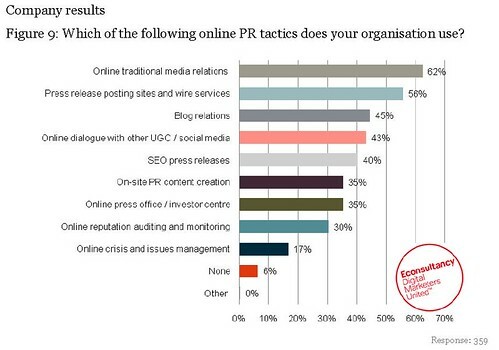 The most common PR activities in social media are online traditional media relations (62%), press release posting sites and wire services (56%) adn blog relations (45%). Twitter, Facebook and YouTube are the most widely used external websites/services. When asked how organisations are using Facebook, more than two thirds of companies (67%) are using Facebook as a marketing channel. 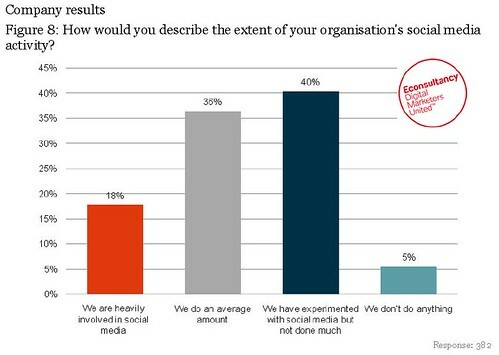 Around a quarter of company respondents (26%) said their most senior managers were “very interested indeed” in social media, compared to 19% who said there was “very little interest”. Social network profile creation and management is still the most widely used social media tactic, although the proportion of companies who do this has decreased from 65% last year to 56% this year. Direct traffic (72%) is still regarded as the most important metric for assessing social media activity. Almost three-quarters of respondents say this is one of the three most important metrics they use. 45% of responding companies don’t have any policies or guidelines for the use of social media. A sample report can be found here.